At a first glance, this image appears to tell a coming-home story. The four soldiers coming from the east look as if they are taking a breath of fresh air. The smile of the soldier on the left portrays an emotion of pride and happiness. From what we can see of the east, there are no reporters. There are only soldiers in a one colour uniform providing us with a distinction between the colourful west and the monotone east. It is visually appealing because it illustrates a contrast between the two sides of the wall. The wall is lowering towards the beholder of the photo, creating distinct layering and making the photo highly informative. It’s an emblematic photo because it is taken at a moment when the wall is still up and only a small portion has started to fall. It is a raw moment as the communists and the capitalists, are re-integrating. The wall itself, from the west side, has been graffitied establishing an expressive connection from the western population. The bottom layer from where we perceive the image, displays a range of colours and people in all different outfits. There are some police men at the front as well as soldiers from the west side controlling the lowering of the wall. Everyone is bustling and pushing each other to get a good angle and view of the other side. There are many people attempting to capture this moment. Cut down until it became no more. The above poem narrates, the nation of Berlin as two million hearts experiencing the end of the cold war. This portrays the synchronicity of the contrasting sides of the country. In the exposition, the war is introduced as “a ticking time bomb, whose time never came.” This metaphorically pays tribute to the tension surrounding the antagonist. “Rigid regulation,” is alliteration used to further define the conflict as division inflicted by the wall, a result from the war. The thawing of the cold war is a pun, which highlights the initiating incident. The rising action encompasses the emotion portrayed in the photo, anticipation for the fall. Researching the grandness of the events unfolding, as well as the context behind the photo; helps to fuel the poem with little events that occurred in order to create the big picture. Racing hearts, people bustling and the hope of capturing the historical moment. The unison of the armies who have come together to fulfill a common task. The climax, being the destruction of the wall, is an allusion to a speech by Winston Churchill in which he addresses the wall as an Iron Curtain. This helps the reader to grasp the concept of division between the east and the west. The resolution is the greatest party known to history, with two million attendees and the mixing of cultures. The conclusion is the consumption of capitalism by the communists who adopt their government system to mend their broken hearted nation. Library, CNN. “Berlin Wall Fast Facts.” CNN, 8 Aug. 2018, https://edition.cnn.com/2013/09/15/world/europe/berlin-wall-fast-facts/index.html. Accessed 12 Apr. 2019. Mallie, Gerard. GERMANY – WALL – COMMUNISM. 11 Nov. 1989. Rank, Michael Scott. 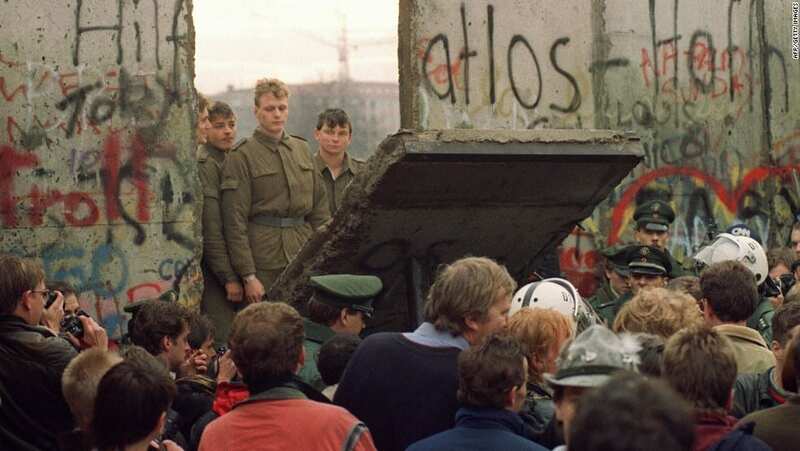 “What Was the Iron Curtain?” History on the Net, 2000-2019. https://www.historyonthenet.com/what-was-the-iron-curtain. Accessed 14 Apr. 2019.